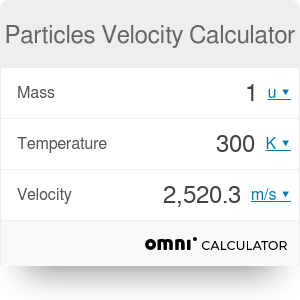 The particles velocity calculator helps you calculate the average velocity of gas particles. All you need to know is the temperature of the gas and the mass of its particles. Average speed is one of the information contained in the Maxwell-Boltzmann distribution. You can check out the calculator right now, or keep on reading to learn more about the physics behind it. Particles in a gas move and collide according to Newton's equations of motion. However, the sheer number of particles, of the order of Avogadro number 10^23, makes it unfeasible to trace a motion of each particle. Instead, we describe the gas of particles using emergent features such like a temperature: check the ideal gas law calculator to learn more about the ideal gases and temperature. The temperature is just average kinetic energy of a particle in the gas. It does not make sense to talk about a temperature of a single particle but makes a lot of sense to talk about the temperature of the gas. If you want to get to know more about the kinetic energy, check the kinetic energy calculator. m is the mass of particles. <v> is the average, or mean, speed. The formula means that if we were to draw a random particle from the gas, it would (on average) have velocity <v>. You can quickly compute the average velocity with the particles velocity calculator. Just specify the mass of particles and the temperature. You will soon notice that as the mass gets larger, the average velocity drops. The heavier the particles, the slower their motion at the same temperature. To specify mass of particles, it is convenient to use the atomic mass unit (u or Da). One atomic mass unit is approximately equal to the mass of a single nucleon, be it a proton or neutron. In this unit Carbon atom weights 12 u, Oxygen 16 u and Carbon Dioxide weights approximately 44 u. Particles Velocity Calculator can be embedded on your website to enrich the content you wrote and make it easier for your visitors to understand your message.